A relaxing holiday in the Himalayan country, Kathmandu Pokhara Tour is a weeklong vacation program to relax and soothe your soul as you explore the rich cultural, natural, spiritual and historical heritages of the country. The refreshing vacation starts with the exploration of the affluent ancient and medieval art and architectures in Kathmandu, Patan, and Bhaktapur existing proudly as a brilliant example of affluent Newari culture. Mesmerizing views of the sunrise and sunset amidst the Himalayas where they glisten in the golden rays of the sun are not only serene but fills your heart with peace and calmness. 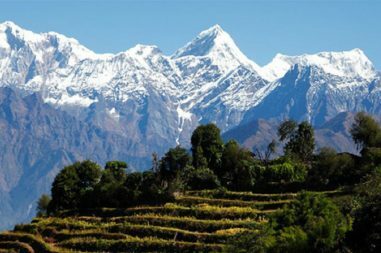 Kathmandu Pokhara Tour henceforth has become the diversified city excursion. If you really wish to make your holiday a different in terms of attractions then this is the best package to choose put forwarded by Bharal Adventure Pvt. Ltd.
As you extend your visit to the Lake City, its rich natural beauty and serenity welcome you for one of the most amazing and relaxing vacations amidst the mesmerizing views of the Himalayas. It is an exceptional opportunity to not only explore the cultural, spiritual and natural heritage to soothe your soul but also an irresistible chance to experience and indulge in the mouthwatering and delectable authentic and savory taste of Nepal. 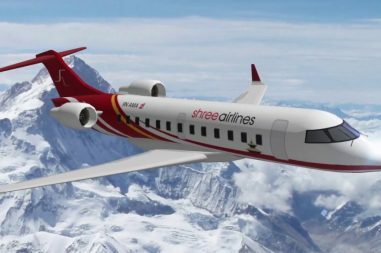 The exploration of the caves and bird-like flying for the paragliding as well as mystical boating makes your Nepal stay a mesmerizing holiday. A book such extravagant package with Bharal Adventure Pvt. Ltd. Upon the arrival at the Tribhuvan International Airport in Kathmandu, the guests will be greeted by a representative from Bharal Adventure who will take them to their hotel for checking in. You can either spend the day resting in your hotel or going on a leisurely stroll around Thamel. The guests will be treated with a savory authentic Nepali cuisine for dinner which will also be an attempt to make them familiar with Nepali cuisine in the evening. The sightseeing tour to four of the UNESCO World Heritage Sites in Kathmandu begins just after breakfast. Kathmandu Durbar Square, Pashupatinath Temple, Swayambhunath Temple and Boudhanath Stupa are four of these sites. Kathmandu Durbar Square is an excellent example of Nepalese art and architecture while Pashupatinath, situation on the banks of river Bagmati, is one of the most famous temples of Lord Shiva. Swayambhunath, meaning self-born, is a popular Buddhist shrine popular among the touristsa as The Monkey Temple because of the large population of monkey in the area. Boudhanath stupa on the other hand is one of the largest stupas in South Asia build on the ancient trade route to Tibet. Patan Durbar Square and Bhaktapur Durbar Square are two other sites listed under UNESCO World Heritage sites. The former is rich in ancient medieval arts and architecture and is the most excellent example of Newari culture of the Malla Kings. Bhaktapur Durbar Square, also an old palace square, is an incredible square located in the irresistible city with authentic local lifestyle that has been preserved over centuries of isolation from the hustle and bustle of Kathmandu. Nyata-Pola temple, the Golden Gate, water spouts, the 55 Window Palace and Dattatreya Temple are some of the major attractions of the city which also serves mouthwatering Newari delicacies. From here, we drive to Nagarkot to view one of the best sunsets in the Himalayas. Waking up early in the morning to view the first rays of sun falling on the mighty Himalayas is an excellent way to start the day. After enjoying the enchanting sunrise and having breakfast, we start our drive to Pokhara, the beautiful Lake City that accommodates seven lakes within it including Phewa Lake, Begnas Lake and Rupa Lake being some. As we arrive at Pokhara, we are rewarded with the majestic views of the Himalayas including Dhaulagiri (8,167m/26,794ft), Manaslu (8,156m/26,759ft), Machhapuchhre (6,993m/22,943ft), the five peaks of Annapurna and others. After taking rest for a while, we will got out on a stroll in the streets of Pokhara and enjoy the rich natural beauty of the city or we could also go for evening boating in the Phewa Lake. 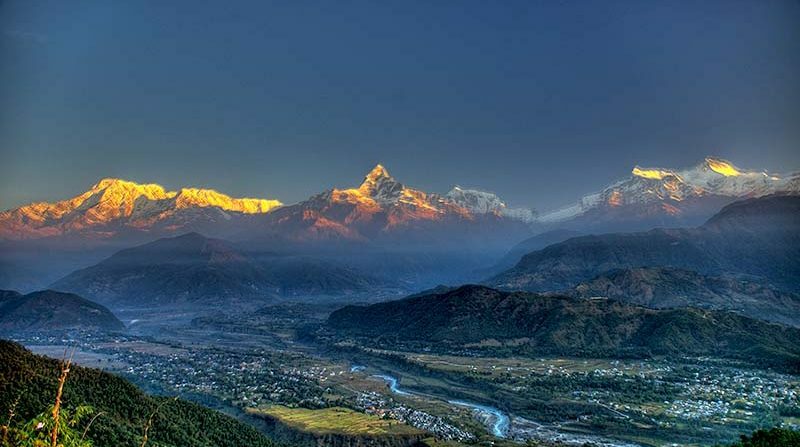 We head off to Sarangkot hill early in the morning to catch the glimpse of Annapurna and Dhaulagiri Mountain Ranges glistening in the golden rays of the morning sun. We descend down to Pokhara after witnessing the compelling sunrise amidst the mighty Himalayas. After quick breakfast, we head off to explore some of the brilliant landmarks in the city such as Devi’s Falls – a unique waterfall following directly into a narrow and deep canal which has no end, Shiva Cave which houses a shrine dedicated to Lord Shiva, Phewa Lake – the largest lake in Pokhara, Taal Barahi Temple locagted at the center of Phewa Lake and Bindabasini Temple – the guardian goddess of Pokhara. We will also be visiting the famous International Mountain Museum (IMM) which records, documents and chronicles the past and present development of mountaineering activities in the world, especially the Himalayas. We can also go on a tour to Tibetan Refugees Camp and witness the everyday activities of the refugees involved in producing and trading woolen carpets and other handicraft items. Bidding our farewell to the beautiful lake city, we take our return drive to Kathmandu along the river banks offering amazing views of the terraced farmland, green hills and rural Nepalese lifestyle. As we reach Kathmandu, we can either spend the rest of the day resting or going for souvenir shopping in Thamel. In the evening, Bharal Adventure will host a farewell dinner to celebrate the successful closure of your one week vacation in the Himalayan country affluent in cultural and natural heritage. At the end of the week long relaxing vacation in Nepal, you will be escorted to the international airport by a representative of Bharal Adventure approximately three hours before your scheduled flight.